In an accessible and timely work of scholarship, celebrated historian Joshua B. Freeman tells the story of the factory and examines how it has reflected both our dreams and our nightmares of industrialization and social change. He whisks readers from the early textile mills that powered the Industrial Revolution to the factory towns of New England to today's behemoths making sneakers, toys, and cellphones in China and Vietnam. 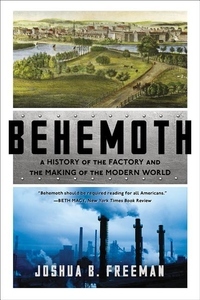 Behemoth offers a piercing perspective on how factories have shaped our societies and the challenges we face now.